Laminate flooring in most houses is a beautiful upgrade, it is stylish, looks better than linoleum and it doesn’t trap all of the dirt and other filth that carpet does. However, laminate flooring is also touchy and special care, such as not walking across it wearing stilettos (sorry girls), has to be taken to keep it looking its best. This special care extends to the way it needs to be cleaned as well as the components that make up the laminate flooring do not stand up as well to what is considered normal cleaning for other types of flooring. Cleaning up loose dirt or dry messes from your laminate flooring is very similar to what you would do for linoleum. It is safe to use a broom to sweep up these types of messes or to use a vacuum cleaner that does not have the rotating brush underneath (also known as the beater bar). Using a dust mop or a disposable dry mop pad (Swiffer) works well when there is no big mess and you just want to get a quick clean done on the flooring. For those sticky messes or the general dirtiness that all flooring builds up over time, a delicate liquid approach can be used to get the flooring cleaned. 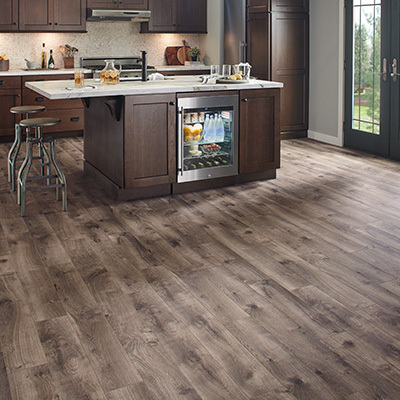 First, check with the manufacturer of your particular laminate flooring to find out what cleaner they recommend using. If the cleaner that is recommended is too expensive or if you are not able to find it anywhere to purchase it, you can use vinegar or window cleaner can be used as an inexpensive cleaning solution to use for mopping laminate floors. You can also make your own cleaner at home with a combination of vinegar, rubbing alcohol and water. Take all three ingredients and mix together in equal parts; 1 cup vinegar, 1 cup water and 1 cup rubbing alcohol. You can also adjust the amounts to make less or more depending on how much of this homemade cleaner you need. Do Not get too much water or cleaner on your laminate flooring, the excess liquid causes the laminate to expand and will lead to other bigger problems. Do Not scrap a mess off of your laminate flooring, use a slightly damp cloth or special cleaner to clean up any stuck on messes. Do Not start using a new cleaning method or cleaner without first testing it in a small section of flooring that is hidden from view. Better to stain or hurt a small section than destroy the whole floor.